Star Corsairs wasn’t really a priority on my list of games to give my opinion on but a recent post on the developer’s blog got me thinking. Perhaps I should do my small part for helping indie developers where I can. So we have a Star Corsairs mini-review 🙂 This game was developed by a single guy over about 6 months, which is quite an impressive feat in its own right. Star Corsairs is a top down, space exploration, massively multiplayer online game. You can play a fair bit for free but to reach the top you need to subscribe. I must admit that I only played this game for a few hours. Although I like the style of the game (I have an upcoming review of Space Pirates and Zombies in the works), I just didn’t feel there was enough variety to justify a grind or make it entertaining. The basic premise of the game is that aliens are invading and you (and your friends) are fighting the power. You start with the typical small space ship and work on building a bigger and better space ship by collecting resources and cash and crafting one. Yes, you craft your spaceship one part at a time. Each type of resource effects each piece of your crafting differently resulting in more or less power usage, shield regeneration, etc, depending on the combination you use. Thankfully the outcome of the manufacturing process is displayed for you so you can decide in advance and without experimenting what combinations you like to use. I must say I quite liked the complex nature of the ship manufacturing process. You get money by completing fairly standard “destroy alien” quests, and destroying the aliens themselves. 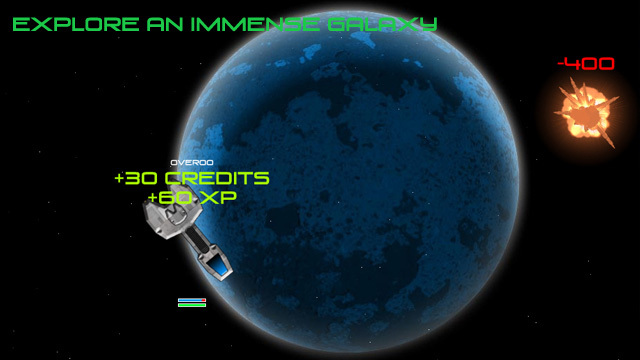 You gather resources by mining the asteroids in each sector and taking them back to home base. This basic game play is quite enjoyable at first but I found it a bit dull after a couple of hours. There is no travel time as such and you can warp straight to a sector, which reduces the tedium of mining resources somewhat. Combat is fairly basic at the moment but the developer is slowly adding new features. One of the best of the game is the ‘fire button’ at the bottom of your screen, which graphically displays which way your turret is facing and the time until it is recharged and ready to fire again. The graphics are generally quite crisp and easy to use, but nothing special. I can’t comment on the sound as I often play games without my sound on. Personally I won’t be playing this game as there are too many others I’d prefer to play first. Overall I’d rate it 5/10 and suggest you check it out if you have the time to devote to a fairly grindy 2-D space shooter MMO. The demo is quite easy to access and you don’t need to put in credit card numbers or anything like that. This entry was posted on Monday, November 7th, 2011 at 9:29 am and is filed under Games, Reviews. You can follow any responses to this entry through the RSS 2.0 feed. Both comments and pings are currently closed.